A LED light bar is a strip of several LEDs which can be mounted on a vehicle, boat, machinery, or even a house. They differ from traditional bulbs in that they are powerful, eco-friendly, and long-lasting. While hunting for one, it’s essential that you put into consideration the following factors. Brightness: Brightness is measured in Lumens. Different models have different lumen output. Size: LED light bars come in various sizes from 4’’ to 52’’. Different sizes may also translate to varying brightness. Shape: You’ll have to choose between rectangular, round, and square shaped LED bars. The shape may affect the distance the beam of light is cast and the positioning as well. 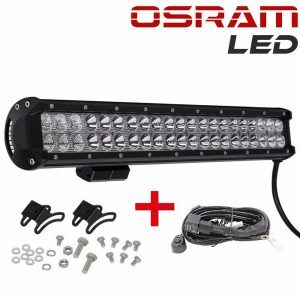 If you’re in need of a LED light bar that installs easily and is bright enough, Turbo Marketing SII Osram has it. This one requires 10-30 volts only making it more compatible with a wide array of automobiles. Regarding durability, this gadget is unbeatable. The Lens are PC constructed while the casing features 6063 aluminum and a stainless steel bracket. 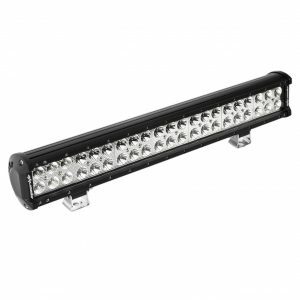 Bringing with it 42 ultra bright LEDS and its heavy-duty construction, this bar is perfect for military, heavy machinery, and off-road vehicles, etc. Its over 50,000 hours’ lifespan should wash away any doubts of its longevity of use. 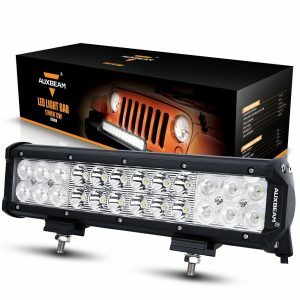 Auxbeam is a great option for anyone looking for a light bar. It illuminates a wide area with a spot lighting of 30 degrees and a flood lighting of 60 degrees. The IP67 waterproof rating makes it a great outdoor accessory. It also has excellent dust proofing features which make it a must-havce item. In fact, this LED light bar can stand full immersion of up to 3M for as long as 30 minutes. This is a great waterproofing ability, by all means. Something else, one gets up to 7200lm flux and a 24 ultra-grade LED light enabling them to clearly see everything even in darkness. Nilight is a big name in the world of LED bars. This 22’’120w is one of its well-known products that are being sought for by anyone who owns a motorcycle, truck, SUV, boats, etc. With an IP67 waterproof rate, you can deep it 1 meter in water for half an hour without any damage. This makes it an all-weather LED bar you should rely on throughout the year. This bar has stainless steel brackets that never rust. It also offers 30,000 hours lifespan. Again, it features high-quality die-cast aluminum with excellent heat elimination. Ideally, this LED light bar should last you not less than 5 good years. This is a 32-inch super powerful bar which has been sturdily built for heavy duty use. Its curved design means that you’re getting a broader viewing area. Mictuning 3BC239C can shine up to 15,000 lumens. 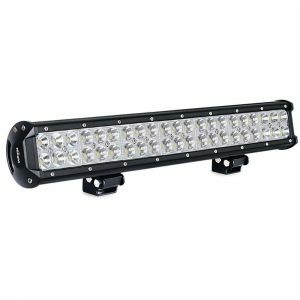 It requires 10-32V and will power the floodlights at 600 and the spotlights at 300.This bar has die-cast aluminum cast housing. The LEDs feature a heavy PC glass that gives you more options of where you can position it. Moreover, it comes with a 12ft wire that adds on to your freedom of placing the bar. You also get a free rocker switch with this purchase. This is an extremely cheap way of dictating when your day ends. It’s a 20’’ bar with a total of 42 super clear LEDs. 18 of the LEDs light at 300 while the rest light at 600. Eyourlife 20’’ has been specially designed to fit a wide range of automobiles provided they have a 10-30 powering source. This light bar is IP67 waterproof rated. It’s also rustproof, dustproof, and anticorrosive. Moreover, this Eyourlife Led Light Bar comes with all the accessories you need to fit it on your 4×4, Jeep, Motorcycle, Boat or any other automobile. Again, it comes with a full year warranty. 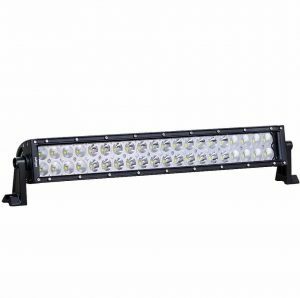 Boasting a stellar combination of flood beams and spot beams, this is a great LED light bar. It offers a crystal clear visibility and covers a large distance at any give time. Of course, the light also illuminates a broad section allowing one to view everything within their vicinity. Something else, there’s a great heat dissipation thanks to its ultra-grade silicone conductor and redesigned aluminum housing. The conduction silicone and aluminum alloy housing deliver a superior cooling thus keeping the light bar safe for a long time. The IP67 waterproof rating makes it perfect for outdoor uses while its dustproof construction makes it a great option for anyone looking for a great product. The lamp can also be slid after installation thus allowing one to illuminate a wide area. The wide compatibility makes it great for use with trucks, SUVs, ATVs, Cars or even jeeps. Again, you can also use it for several indoor activities. 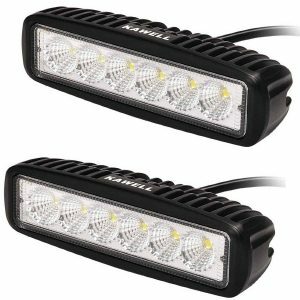 These 2 LED light bars feature a rough construction and have a wider range of application. They have an operating range of 9-32V and will give you a 6500K color temperature. Again, these Kawell LED Light Bars can shine 1170 lumens and promises 50,000 hours lifespan. The aluminum material used for its housing and stainless steel on its mounting brackets is another plus to their durability. Their design allows you to install them in a breeze either on your boat, motorcycle, truck, SUV, etc. Auxbeam is a CE and RoHS certified light bar, smaller in size, but with an incredible performance. It offers 2 lighting angles and requires 9-32V power to operate. Its 7200 luminous flux is what you require as you drive through the rough terrain, in the snow, and even through the rain. 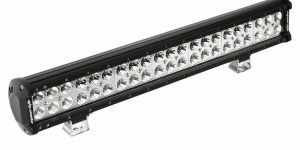 This IP67 rated light bar has been designed to withstand extremely harsh conditions regarding weather or application. It also has a unique vertical fin construction which enables improved heat elimination. 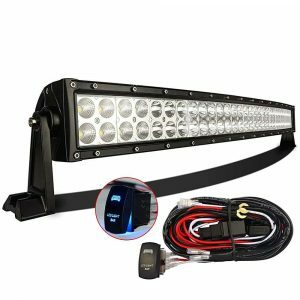 A package of this item contains 2 LED light bars with high-quality performance. These have specifically been designed for off-road use only. With an ultra bright 6000k rating, this pair of LED bars is here to see that nothing goes unnoticed along the road. 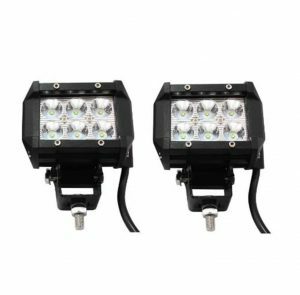 Its high quality die cast aluminum construction and a tough glass protecting the LEDs makes it easy to install this pair almost anywhere without worrying about flying objects. They are extremely durable with a lifetime of not less than 50,000 hours. These 4 bars each measuring 4’’ top our list of the best LED light bars for this year. 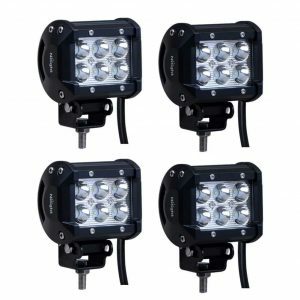 They use the latest LED chips to bring super clear visibility on the dark, rough road, in your backyard, or anywhere else where flood light is necessary. They are durable, thanks to their heavy duty construction and unbeatable heat dissipation. Their design allows you to adjust the direction of the beam of light courtesy of the mounting bracket. This award winning contender is 100% waterproof, rustproof, and dustproof. True to its quality, Nilight backs these LED bars with 2 years warranty. As you may have noticed, all the above LED Light Bars has an IP rating of more than 65. This is because bars below this range are mainly of low quality and don’t hold on for long.